In 2008 the Bendigo Symphony Orchestra was fortunate to receive a substantial grant from the Abbott foundation to purchase new orchestral parts. 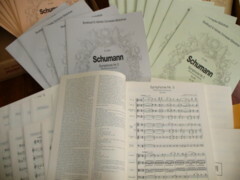 This purchase has been enhanced by donations to the orchestra’s library by some of our members. Any new purchases have aimed to include the most up to date editions, including Bärenreiter and Breitkopf & Härtel urtext editions. The BSO is keen to make its library available to other community ensembles, and would welcome enquiries. The list below details some of the orchestra’s recent purchases. Please email the orchestra: BendigoSymphony@hotmail.com for a full listing of the library holdings and hire rates.